As the debate over the nation’s immigration laws continues on Capitol Hill, Congress has its own share of lawmakers for whom the immigrant experience is a personal one: At least 64 of the current 529 voting members of Congress (or 12%) are immigrants or the children of immigrants. There are 12 foreign-born members of the 115th Congress – 11 representatives and one senator, Mazie Hirono, D-Hawaii, who was born in Japan. At least 52 other members were born in the United States or its territories to at least one immigrant parent, including 37 in the House and 15 in the Senate, according to a Pew Research Center analysis of biographical information from the Congressional Research Service, news stories, and members’ official websites and genealogical records through Aug. 17. Democrats far outnumber Republicans among both first- and second-generation immigrants in both chambers. All but one of the 12 foreign-born lawmakers are Democrats – the exception is Cuban-born Rep. Ileana Ros-Lehtinen, R-Fla. – while Democrats account for 38 of the 53 members who are children of immigrants. Republicans account for 13 second-generation members. In addition, Sen. Bernie Sanders of Vermont, whose father came to the U.S. from Poland, is an independent, though he caucuses with Democrats. 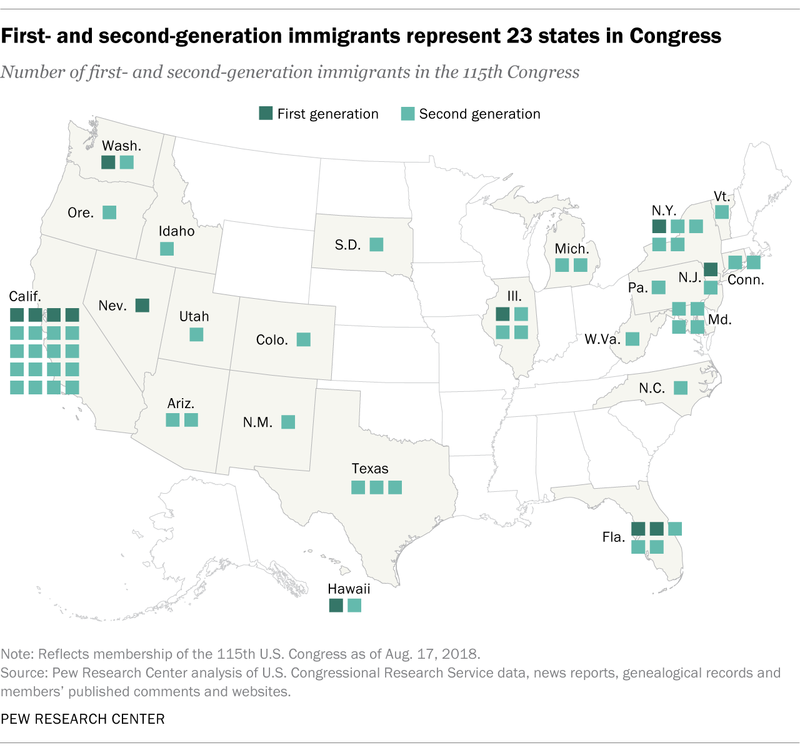 First- or second-generation immigrants in Congress represent 23 different states. 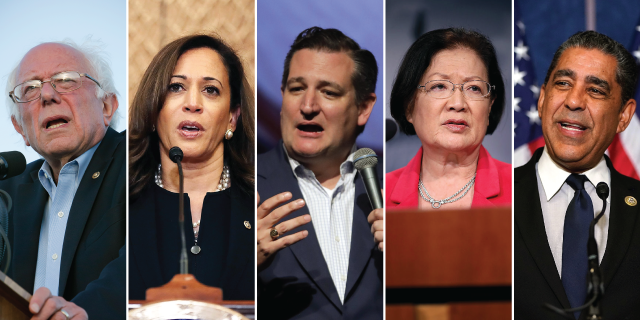 California has by far the most: At least 19 of the state’s 53 House members – more than a third – are immigrants or the children of immigrants, as is Democratic Sen. Kamala Harris, whose mother emigrated to the U.S. from India and whose father emigrated from Jamaica. New York and Florida each have five first- or second-generation immigrants among their members of Congress; Maryland and Illinois each have four. Countries and territories of origin vary for both first- and second-generation immigrant lawmakers. Seven of the 11 foreign-born House members emigrated from Latin American or Caribbean countries (three from Mexico, two from Cuba, one from the Dominican Republic and one from Guatemala), while the other four hailed from different Asian countries and territories (India, Japan, Taiwan and Vietnam). 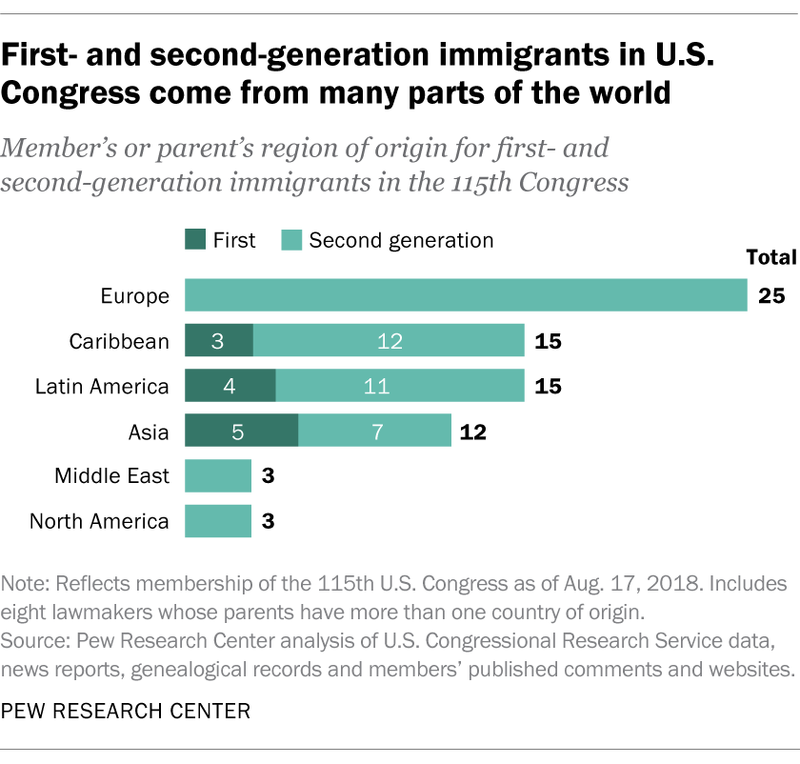 Among second-generation lawmakers, most have European, Latin American or Caribbean heritage: Their families come from 29 countries and territories, including Mexico (10 lawmakers), Cuba (seven), Germany (six), and Canada, India and Jamaica (three each). The dozen members of the House and Senate who were born in another country account for 2% of Congress – a slightly higher share than in the last Congress (1%), but down substantially from earlier Congresses and far below the foreign-born share of the U.S. population as a whole (14%). U.S.-born children of immigrants (second-generation Americans) make up another 12% of the nation’s population. Some foreign-born members of Congress have unique back stories. One is Rep. Stephanie Murphy, D-Fla., whose parents fled Communist-controlled Vietnam aboard a boat when she was just an infant. Reps. Ros-Lehtinen and Albio Sires, D-N.J., who was also born in Cuba, came to the U.S. as children when their families escaped Fidel Castro’s government. Reps. Adriano Espaillat, D-N.Y., and Ruben Kihuen, D-Nev., are the first formerly unauthorized immigrants to serve in the U.S. Congress. Espaillat, born in the Dominican Republic, and Kihuen, born in Mexico, were both brought to the U.S. as young children by their parents. In the current Congress, several second-generation legislators’ parents settled in the U.S. to evade oppressive regimes or religious violence. Rep. Michael Bennet, D-Colo., is the son of a Polish Holocaust survivor. His mother and Jewish grandparents were imprisoned in the Warsaw ghetto during World War II. His grandparents smuggled his mother – who was just a baby – to safety through an underground network. Rep. Anna Eshoo, D-Calif., was born in the U.S. to an Armenian mother and Iranian father, both of whom fled anti-Christian violence in the Middle East. Throughout history, 413 foreign-born Americans have served as members of Congress (out of more than 12,000 total members), according to an earlier Pew Research Center analysis and additional information from the Congressional Research Service. That includes 353 immigrants who served only in the House of Representatives, 45 who served in the Senate and 15 who served in both chambers. Under the U.S. Constitution, an immigrant taking office in the House must be a U.S. citizen for seven years or more, age 25 or older and living in the state where he or she is elected. To serve in the Senate, nine years of citizenship are required, and the person must be 30 or older and live in the represented state when elected. Those born outside the U.S. cannot become president. For example, if the speaker of the House were foreign born, he or she could not become president in the event that the president and vice president both die or leave office. Our count of first-generation lawmakers does not include members who were born abroad but who gained U.S. citizenship through their American parents after meeting legal requirements. (There have been 21 members in this category since 1949.) Nor does it include those born to U.S. citizen parents in certain U.S. territories, such as Sen. John McCain, R-Ariz., who was born in the Panama Canal Zone when it was under U.S. jurisdiction. The list also excludes 19 lawmakers who left office for various reasons since the beginning of the 115th Congress. Our tally of second-generation legislators relied on published news stories, congressional members’ public comments and, when available, genealogical records. If you know of an additional legislator not included on our list, send us an email at facttank@pewresearch.org. Correction (Aug. 30, 2018): A previous version of the table below gave an incorrect birth country for Rep. Henry Cuellar’s mother. In addition, the text and both charts in this post were updated Jan. 23, 2019, to reflect Tulsi Gabbard’s paternal parentage; her father was born in American Samoa. Note: Table reflects membership of the 115th U.S. Congress as of Aug. 20, 2018. Though included in this analysis, the Palestinian territories are not recognized as an independent state by the U.S. State Department. Brown’s father was born in Cuba but immigrated to the U.S. from Jamaica, where he was raised. Meng’s father was born in China but raised in Taiwan. Source: Pew Research Center analysis obtained from U.S. Congressional Research Service (first-generation immigrant lawmakers) and legislators’ published comments and news reports (second-generation).